In the last years, the various prototypes for one of the possible future hadronic calorimeters – that part of a detector that measures the energy of all passing particles – have gone through a broad variety of tests in a variety of configurations. However, they have never before been tested in connection with a beam telescope – until now. 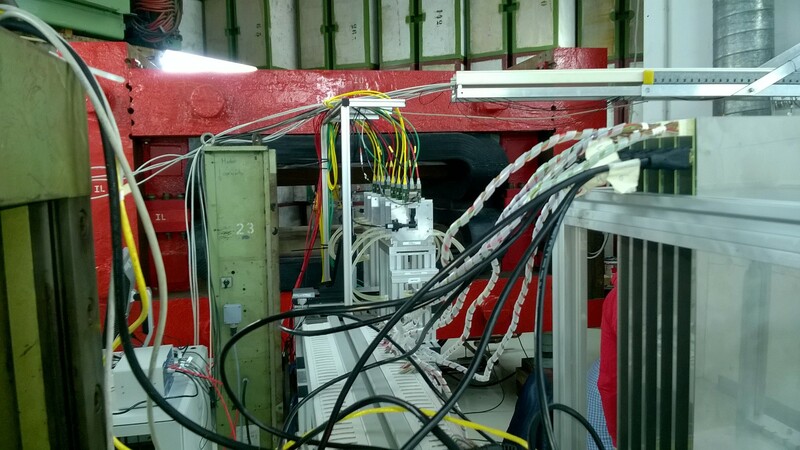 In a little over a week in October, a small team from DESY, the University of Sussex and Prague University tested the performance of six layers of future detector in connection with the AIDA/EUDET beam telescope. The goal was to check whether the two could indeed work together – a proof of principle of sorts – and gather more details of the tile structure and spatial resolution of the calorimeter. Normally the setup is a bit like a horizontal sandwich: two arrays of telescope detectors layers form the bread that holds the filling – the test object. Here, the test object (six layers of hadronic calorimeter) sat behind two parts of telescope toast because the six calorimeter layers would not have fit the space. The working principle is the same, however: any beam particles coming from the accelerator (DESY’s electron synchrotron in this case) pass through telescope and test object, so anything the telescope sees should be seen by the test object as well. In the beginning this proved a challenge for the HCal team because of the configuration of the telescope that currently caters more for LHC detector tests. Detectors for the linear collider do not need to disentangle events and select which ones to keep and which ones to throw away, like detectors at the LHC. At the linear collider there’s a large gap between particle bunches colliding and the collisions are less messy because it’s collisions between elementary particles, electrons and positrons, rather than particles with a substructure like the protons at the LHC. That’s why linear-collider detectors don’t have a trigger that would make a synchronisation with the information from the telescope easier. “We had to figure out which particles seen by the telescope correspond to which particles seen by us,” explains DESY HCal expert Katja Krüger. So before they could start taking real data the HCal team had to make a few modifications to make sure they could synchronise their data with the information from the telescope. The team scrutinised six new layers and will repeat tests in December this year to take advantage of the improved coordination with the beam telescope and add absorber layers. The HCal uses scintillator tiles measuring three by three centimetres with a silicon photomultiplier or SiPM detector. The telescope technology is based on monolithic active pixel sensors and has a very high spatial resolution: it tells users with a precision of 2 microns where particles have passed. The calorimeter team is using this precision to check if their tile structure and the spaces between tiles are visible in the data and how their prototype resolves electron showers, which play an important role in the “working” configuration with absorber layers sandwiched between the detector layers. 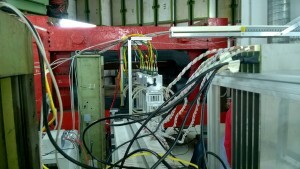 In return, the run with linear collider detector prototypes helps prepare the beam telescope for future tests for example under the AIDA-2020 project with other prototypes, both individually and as a combined campaign. Last year, the CALICE collaboration spent a total of ten weeks in test beams at CERN and DESY testing different calorimeter prototypes and are still in the process of analysing the more than 15 million events recorded during the campaign. At the same time, planning is already underway for the next big milestone: a full prototype, planned for 2018.